Superantigens (SAgs) produced by Staphylococcus aureus at high concentrations induce proliferation of T cells bearing specific TCR Vβ sequences and massive cytokinemia that cause toxic shock syndrome. However, the biological relevance of SAgs produced at very low concentrations during asymptomatic colonization or chronic infections is not understood. In this study, we demonstrate that suboptimal stimulation of human PBMCs with a low concentration (1 ng/ml) of staphylococcal enterotoxin C1, at which half-maximal T cell proliferation was observed, induced CD8+CD25+ T cells expressing markers related to regulatory T cells (Tregs), such as IFN-γ, IL-10, TGF-β, FOXP3, CD28, CTLA4, TNFR2, CD45RO, and HLA-DR. Importantly, these CD8+CD25+ T cells suppressed responder cell proliferation mediated in contact-dependent and soluble factor–dependent manners, involving galectin-1 and granzymes, respectively. In contrast, optimal stimulation of human PBMCs with a high concentration (1 μg/ml) of staphylococcal enterotoxin C1, at which maximal T cell proliferation was observed, also induced similar expression of markers related to Tregs, including FOXP3 in CD8+CD25+ cells, but these T cells were not functionally immunosuppressive. We further demonstrated that SAg-induced TCR Vβ–restricted and MHC class II–restricted expansion of immunosuppressive CD8+CD25+ T cells is independent of CD4+ T cells. Our results suggest that the concentration of SAg strongly affects the functional characteristics of activated T cells, and low concentrations of SAg produced during asymptomatic colonization or chronic S. aureus infection induce immunosuppressive CD8+ Tregs, potentially promoting colonization, propagation, and invasion of S. aureus in the host. Staphylococcus aureus causes some of the most critical infectious disease problems in the United States (1). Annually, S. aureus accounts for ∼5000 cases of toxic shock syndrome (TSS), 70,000 cases of pneumonia, 40,000 cases of infective endocarditis, and >500,000 postsurgical infections, resulting in 12,000 fatalities. Moreover, the increasing occurrence of methicillin-resistant S. aureus with reduced sensitivity to vancomycin urgently requires alternative prevention and treatment strategies (2). S. aureus frequently colonizes skin and mucosal membranes of the host without any clinical symptoms, but it can suddenly erupt into a highly lethal invasive disease, such as necrotizing pneumonia and infective endocarditis, in immunocompromised patients in hospital settings and even in healthy persons in the community (3, 4). Efforts have been made to elucidate the mechanism of occurrence of highly lethal invasive disease by S. aureus in healthy community populations, but such mechanisms remain elusive. Staphylococcal enterotoxins, staphylococcal enterotoxin–like toxins, and TSS toxin-1 (TSST-1) are superantigens (SAgs). Most SAgs bind outside the peptide binding grooves of MHC class II (MHCII) molecules on APCs and specific TCR Vβ on T cells (SAg-reactive T cells) (5, 6). Binding in this manner activates APCs and induces extensive TCR Vβ–dependent proliferation of T cells, causing high-level secretion of proinflammatory cytokines, such as IL-1, IL-2, IFN-γ, and TNF-α, and immunomodulatory cytokines, such as IL-10 and TGF-β (7). The initial expansion of T cells is followed by activation-induced cell death or apoptosis, leading to clonal deletion of SAg-reactive T cells (5, 8). SAg-reactive T cells that escape from clonal deletion fail to proliferate and secrete IL-2. This phenomenon is often referred to as anergy (9). Thus far, 25 SAgs, including SEA through SElX (except F) and TSST-1, have been characterized in S. aureus, and most clinical isolates typically carry five to seven different SAg genes (4, 10). The causal link of SAgs in the pathogenesis of TSS and food poisoning, in which large amounts of SAgs (1–100 μg/ml) are produced, is well established (4, 11). However, relatively small concentrations of SAgs (0.65–5 ng/ml) are produced in more frequently occurring asymptomatic colonization or chronic S. aureus infections (12–14), but the biological relevance of such small concentrations of SAgs in the pathogenesis of S. aureus is not fully understood. During infection, it is crucial to activate innate and adaptive immunity to control the pathogen, but it is equally important to regulate innate and adaptive immune responses to prevent tissue damage. Regulatory T cells (Tregs) have been recognized as a key component in the maintenance of immunological self-tolerance and the control of T cell immunity to prevent tissue damage by an extended proinflammatory response (15). However, immunosuppression by Tregs could be exploited by pathogens to promote infections (16, 17). Tregs can be broadly classified into CD4+ and CD8+ Tregs. CD4+ Tregs have been characterized as thymus-derived CD4+CD25+FOXP3+ T cells, and they can be induced by peripheral conversion of CD4+CD25− conventional T cells into CD4+CD25+FOXP3+ T cells or in vitro–induced CD4+CD25+FOXP3+ T cells by stimulation of PBMCs via TCR using anti-CD3 mAb and anti-CD3/CD28 beads (15, 18–20). CD8+ Tregs were first described as CD8+ suppressor T cells in a mouse study in 1970 (21) showing the adaptive transfer of tolerance. Recently, CD8+ Treg studies have been rekindled because of their crucial roles in autoimmune disease and immunosuppression in transplant recipients. Several studies revealed various subsets of CD8+ Tregs. For example, in humans, repetitive stimulation of CD8+ T cells with allogeneic or xenogeneic APCs induce CD8+CD28− T cells expressing Ig-like transcript (ILT)-3 and ILT-4, which render tolerance in APCs (22, 23). Alloantigenic stimulation of CD8+ T cells with CD3 and CD28 mAbs induces CD8+CD103+ T cells, which suppress effector T cells by a cell–cell contact-dependent mechanism (24). A recent study demonstrated that stimulation of human PBMCs with staphylococcal SAgs (SEA and TSST-1) and streptococcal SAgs (SPEA, K/L) at a low concentration (1 ng/ml) induced CD8+CD25+FOXP3+ T cells with suppressive activity mediated by an unknown cell–cell contact-dependent mechanism (25). In line with these findings, our previous study demonstrated that stimulation of bovine PBMCs with staphylococcal enterotoxin C1 (SEC1), at a concentration resulting in suboptimal T cell proliferation (1–5 ng/ml), induced immunosuppressive CD4+CD25+ and CD8+CD25+ Tregs (13). These results suggest that the strength of TCR signaling determined by the concentration of SAg might differentially regulate phenotypic and functional characteristics of immunosuppressive T cells. In this study, we determined the phenotypic and functional characteristics of human CD8+CD25+ T cells induced by stimulation of human PBMCs with SEC1 at concentrations inducing optimal (1 μg/ml) and suboptimal (1 ng/ml) stimulation. Our results demonstrated that, despite similar expression of phenotypic and functional Treg markers in CD8+CD25+FOXP3+ T cells induced by optimal and suboptimal stimulation, suppressive activity was only observed in CD8+CD25+FOXP3+ T cells induced by suboptimal stimulation. These results suggest that a low concentration of SAg produced during asymptomatic colonization or chronic S. aureus infection induces immunosuppressive CD8+ Tregs that may trigger outbreaks of highly lethal invasive S. aureus infections in healthy community populations, as well as immunocompromised hospital patients. Healthy volunteers aged 18–40 y of age were recruited into the study. The protocol (13–191) was reviewed and approved by the Institutional Review Board at Mississippi State University, and a written informed consent form was obtained from all volunteers. Blood was obtained by venipuncture, and PBMCs were isolated by gradient centrifugation using Histopaque-1077 (Sigma-Aldrich, St. Louis, MO). The isolated PBMCs were resuspended in RPMI 1640 medium containing 10% heat-inactivated FBS, 2 mM l-glutamine, and 1% penicillin-streptomycin (Invitrogen, Carlsbad, CA). Dr. S. Minnich (University of Idaho) kindly provided SEC1, which was purified from S. aureus RN4220(pMIN121) using preparative isoelectric focusing with a broad isoelectric point (3–10) and a narrow isoelectric point (6–8) range of ampholytes in succession (26). To determine T cell proliferation in response to SEC1, human PBMCs were adjusted to 5 × 105 cells per well in a 96-well plate with the indicated concentrations of SEC1 (0.001–10,000 ng/ml). Cells were incubated at 37°C in 5% CO2 for 72 h. Cells were pulsed with 1 μCi [3H]thymidine for 18 h. Cellular DNA was harvested on glass fiber filters, and incorporation of [3H]thymidine into cellular DNA was quantified by liquid scintillation counting. For phenotypic and functional assays, CD25+ cells were depleted from PBMCs using CD25 MicroBeads (Miltenyi Biotec, San Diego, CA) to prevent expansion of pre-existing Tregs (CD4+CD25+ and CD8+CD25+ T cells) and their influence on the induction of Tregs by SEC1. PBMCs depleted of CD25+ cells (PBMC/CD25−) were adjusted to 1.5 × 106 cells per well in six-well plates and stimulated with SEC1 at optimal (1 μg/ml) or suboptimal (1 ng/ml) conditions for the indicated times. For phenotypic characterization of CD8+CD25+ T cells induced by SEC1 stimulation, mAbs specific to human CD8-FITC, CD25-PECy7, CTLA-4–allophycocyanin, IL-10–allophycocyanin, and IFN-γ–allophycocyanin were purchased from BD Biosciences (San Jose, CA). Abs specific for human TCR Vβ2–PE and TCR Vβ14–PE were purchased from Beckman Coulter (Brea, CA). mAbs specific for human CD28-PE, CD127-allophycocyanin, FOXP3-allophycocyanin, GITR-PE, HLA-DR–PE, OX40-PE, and TNFR2-PE, as well as Brefeldin A, were purchased from eBioscience (San Diego, CA). mAb specific for anti-TGF-β–allophycocyanin was purchased from R&D Systems (Minneapolis, MN). For neutralization assays, anti-human IL-10, TGF-β, IFN-γ, and isotype controls for rat-IgG1 and mouse-IgG1 were purchased from eBioscience. To measure cytokine secretion, culture supernatants from suboptimal stimulation with SEC1 were harvested every 2 d and analyzed by a Milliplex 34-plex human cytokine Luminex kit (EMD Millipore, Billerica, MA), according to the manufacturer’s instructions. For surface staining, cells were harvested, washed with FACS buffer (eBioscience), and stained for 30 min on ice with different combinations of mAbs specific for human CD8-FITC, CD25-PECy7, CD28-PE, CD127-allophycocyanin, GITR-PE, HLA-DR–PE, OX40-PE, TNFR2-PE, TCR Vβ2–PE, or TCR Vβ14–PE. For intracellular staining, cells were incubated with Brefeldin A for 4 h under previously described culture conditions, surface stained, and further fixed and permeabilized with the Human FOXP3 Buffer Set (eBioscience), according to the manufacturer’s instructions. Fixed/permeabilized cells were stained with mAbs specific for human FOXP3-allophycocyanin, TGF-β–allophycocyanin, CTLA-4–allophycocyanin, IL-10–allophycocyanin, or IFN-γ–allophycocyanin. Cells were washed with FACS buffer and analyzed using a FACSAria III flow cytometer (BD Biosciences). Data were analyzed using FlowJo software (TreeStar, Ashland, OR). Fluorescence minus one controls or isotype controls were used to ensure that the upregulation was not due to a nonspecific Ab effect. For functional assays, CD8+CD25+ or CD8+CD25− T cells were purified by negative selection with a CD8+ T Cell Isolation Kit II, followed by anti-CD25 magnetic beads (Miltenyi Biotec), according to the manufacturer’s instructions. For some assays, naive CD4+CD25− T cells and CD14+ cells were purified from unstimulated PBMCs using a naive CD4+ T Cell Isolation Kit and a Monocyte Isolation Kit, respectively (Miltenyi Biotec). The purity of isolated cells was routinely monitored by flow cytometry and was consistently >95–99% (data not shown). Naive CD4+CD25− T cells were labeled with 2.5 μM CFSE (Invitrogen) for 5 min at 37°C and washed with warm RPMI 1640 medium. CFSE-labeled naive CD4+CD25− T cells (1 × 105 cells per well, responder cells) were mixed with various numbers (1 × 105, 5 × 104, 1 × 104) of CD8+CD25+ T cells induced by suboptimal and optimal stimulation with SEC1 for 6 and 4 d, respectively. Cells were stimulated with anti-CD3/CD28 beads at a 1:1 ratio. After 4 d, cells were labeled with CD4-PE to separate the CFSE-labeled CD4+ T cells from CD8+CD25+ T cells induced by SEC1 stimulation. Proliferation of CD4+ T cells was determined as the dilution of CFSE signal using flow cytometry. For the contact-dependent suppression assay, CD8+CD25 T cells induced by suboptimal stimulation with SEC1 were treated with 10 μM mitomycin C (Sigma-Aldrich) for 2 h to prevent protein synthesis and proliferation (27, 28). After thorough washing, mitomycin C–treated CD8+CD25+ T cells were mixed with CFSE-labeled responder cells and stimulated with anti-CD3/CD28 beads, as described above. For the soluble factor–dependent suppression assay, CD8+CD25+ T cells induced by suboptimal stimulation with SEC1 were added to the upper chamber of a Transwell (0.45 μm pore size; Corning Life Sciences, Tewksbury, MA), and an equal number of CFSE-labeled responder cells were added to the bottom chamber of a Transwell. Cells were stimulated as described above. In some experiments, mAbs (10 μg/ml) specific for CTLA-4 (eBioscience), IL-10 (R&D Systems), TGF-β (R&D Systems), IFN-γ (eBioscience), or Gal1 (Santa Cruz, Dallas, TX), or the same quantity of isotype controls (eBioscience), were added to cells. In addition, ZM241385 (10 μM, adenosine 2A antagonist; Tocris, Minneapolis, MN), indomethacin (25 μM, COX inhibitor; Sigma-Aldrich), or 3,4-dichloroisocumarin (DCI; 50 μM, serine protease inhibitor; EMD Millipore) was added to the autologous MLR assay, as indicated in the Results. To determine activation of CD8+ T cells by SEC1 via signaling through TCR, we determined the phosphorylation of CD3ζ. CD8+CD25− T cells (5 × 105) were purified and stimulated with 1 ng/ml SEC1 for 10 min in the presence or absence of CD14+ monocytes (4 ×105). Whole-cell lysates were separated by 12.5% SDS-PAGE and transferred to a polyvinylidene difluoride membrane. Phosphorylation of CD3ζ was detected by anti-CD3ζ (phosphoryl Y142) Ab (Abcam, Cambridge, MA), followed by HRP-conjugated sheep anti-mouse IgG (GE Healthcare). The loading control was assessed by immunoblot against β-actin using anti–β-actin Ab (Sigma-Aldrich), followed by HRP-conjugated donkey anti-rabbit IgG (GE Healthcare). Total RNA was prepared from samples taken before and after stimulation of CD8+CD25− T cells with SEC1 (1 ng/ml) for 4 d, and cDNA was synthesized using a cDNA Synthesis Kit (Invitrogen). Selective expansion of TCR Vβ was assessed by quantitative real-time PCR using an ABI Prism 7500 Real-Time PCR system (Applied Biosystems, Foster City, CA), as described previously (29). Data were obtained from three separate experiments for each of two or three donors, generating six or nine independent experiments. Statistical significance among different treatment groups was analyzed with one-way ANOVA, followed by the Tukey HSD for post hoc testing, using GraphPad Prism software (version 7.0.3; GraphPad, La Jolla, CA). Differences with a p value < 0.001 were considered statistically significant. We first measured human T cell proliferation in response to a serial dilution of SEC1 to determine the concentrations needed to induce maximal and half-maximal T cell proliferation to set as the optimal and suboptimal stimulation conditions, respectively. As expected, the T cell proliferation response was positively related to the concentration of SEC1 (Fig. 1A). Maximal T cell proliferation was observed at 1 μg/ml, and approximately half-maximal T cell proliferation was observed at 1 ng/ml. The decreased proliferation observed at 10 μg/ml was likely due to the depletion of culture medium components resulting from vigorous proliferation. Based on these results, we defined the concentrations of SEC1 that induced optimal and suboptimal stimulation as 1 μg/ml and 1 ng/ml, respectively. 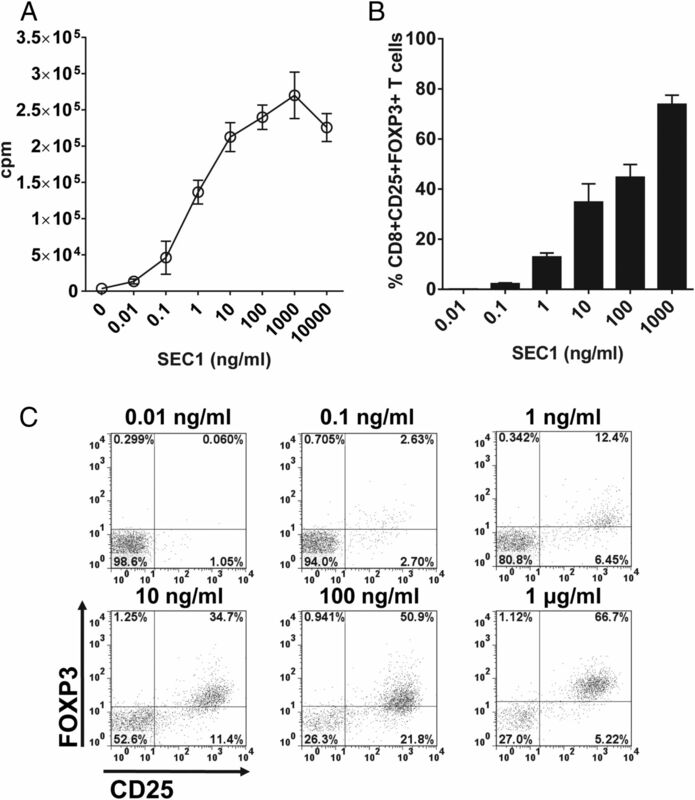 Concentration-dependent expression kinetics of FOXP3 in CD8+CD25+ T cells by SEC1. (A) Human T cell proliferation after exposure to SEC1 for 4 d was measured by the incorporation of [3H]thymidine. The data shown are the mean ± SEM of nine independent experiments (three separate experiments for each of three different donors). (C) Human PBMCs were stimulated with various concentrations of SEC1 for 4 d, and expression of CD25 and FOXP3 in CD8+ T cells was measured by flow cytometry. The data shown are from a single representative experiment. (B) Percentage (mean ± SEM) of CD8+CD25+FOXP3+ T cells combined from nine independent experiments. To examine the kinetics of the SEC1 concentration–dependent changes in the expression of FOXP3 in human CD8+CD25+ T cells, PBMC/CD25− were stimulated with various concentrations of SEC1 (0.01 ng/ml to 1 μg/ml) for 4 d. CD25+ T cells were depleted to prevent expansion of pre-existing regulatory cells commonly expressing CD25. Expression of FOXP3 in CD8+CD25+ T cells was positively related to the concentration of SEC1. Expression of FOXP3 in CD8+CD25+ T cells was the highest at 1 μg/ml and gradually decreased with lower concentrations of SEC1 (Fig. 1B, 1C). To examine the kinetics of expression of FOXP3 in CD8+CD25+ T cells, human PBMC/CD25− were stimulated with SEC1 under optimal (1 μg/ml) and suboptimal (1 ng/ml) conditions for up to 8 d. Under the optimal stimulation condition, expression of FOXP3 in CD8+CD25+ T cells rapidly increased and peaked at day 4 poststimulation (62.4 ± 11.5%) and gradually decreased thereafter (Fig. 2). In contrast, under the suboptimal stimulation conditions, FOXP3 expression by CD8+CD25+ T cells was delayed, but it gradually increased, such that 54.35 ± 6.5% of cells expressed FOXP3 at day 8 poststimulation (Fig. 2). Time-dependent expression kinetics of FOXP3 in CD8+CD25+ T cells induced by stimulation with SEC1. Human PBMCs were stimulated under optimal (1 μg/ml) and suboptimal (1 ng/ml) concentrations of SEC1 for up to 8 d. Expression of CD25 and FOXP3 in CD8 T cells was measured using flow cytometry. (A) Data shown are a single representative experiment gated on CD8+ T cells. (B) Percentage (mean ± SEM) of CD8+CD25+FOXP3+ T cells combined from nine independent experiments (three donors). To determine the functional characteristics of CD8+CD25+ T cells induced by optimal and suboptimal stimulation with SEC1, we conducted autologous MLR. PBMC/CD25− were stimulated with 1 μg/ml (optimal stimulation) or 1 ng/ml (suboptimal stimulation) SEC1 for 4 or 6 d, at which time FOXP3 was highly expressed in CD8+CD25+ T cells. Purified CD8+CD25+ T cells were cocultured with freshly prepared autologous CFSE-labeled naive CD4+CD25− T cells (responder cells) in the presence of anti-CD3/CD28 beads as T cell stimulants. To separate the responder cells from CD8+CD25+ T cells, cells were stained with CD4-PE, and CD4+ T cells were gated as depicted in Supplemental Fig. 1. 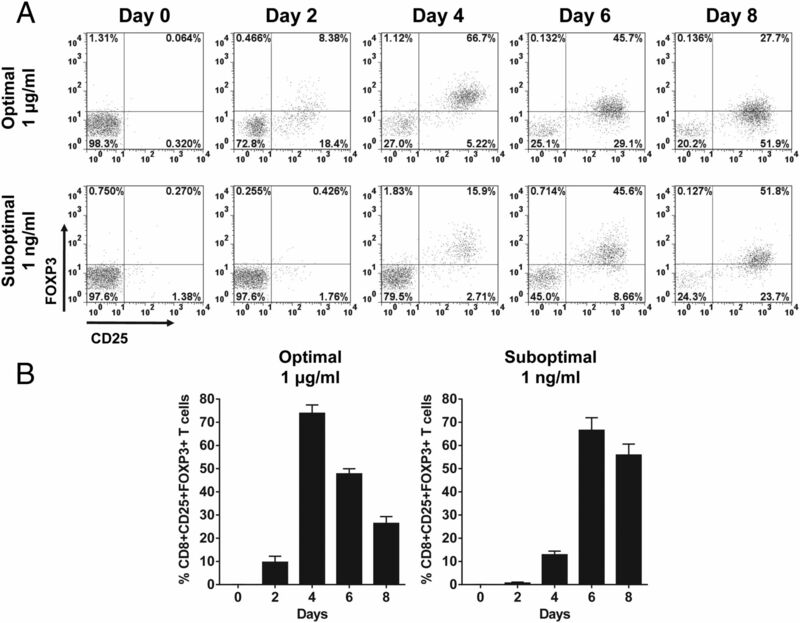 As expected, anti-CD3/CD28 beads induced proliferation of naive CD4+CD25− T cells (Fig. 3A). Proliferation of naive CD4+CD25− T cells was significantly inhibited by CD8+CD25+ T cells induced by suboptimal stimulation with SEC1. The suppression was positively related to the number of CD8+CD25+ T cells induced by suboptimal stimulation with SEC1 (Fig. 3B, 3D). In contrast, CD8+CD25+ T cells induced by optimal stimulation with SEC1 slightly increased the proliferation of naive CD4+CD25− T cells (Fig. 3C, 3D). In the absence of anti-CD3/CD28 beads, CD8+CD25+ T cells induced by optimal stimulation with SEC1 did not induce the proliferation of naive CD4+CD25− T cells, indicating that there was no SEC1 contamination in CD8+CD25+ T cells purified after stimulation with SEC1 (Fig. 3C). Together, these results demonstrate that CD8+CD25+ T cells induced by suboptimal stimulation with SEC1, but not optimal stimulation, are functionally immunosuppressive. Suppression of naive CD4+CD25− T cell proliferation by CD8+CD25+ T cells induced by suboptimal stimulation with SEC1. 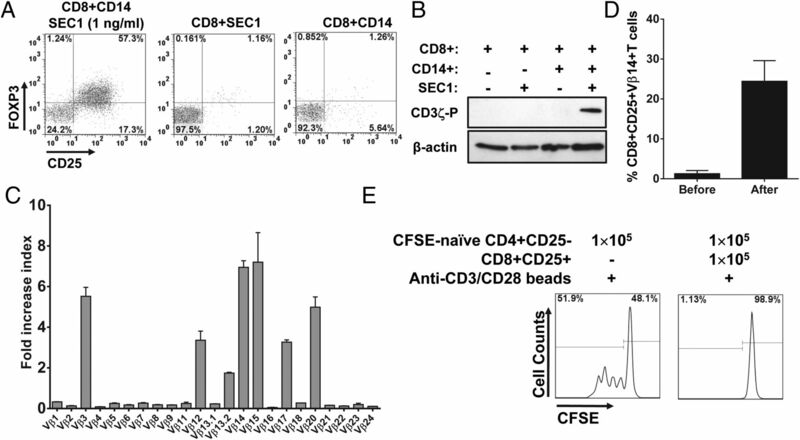 (A) Naive CD4+CD25− T cells were purified, labeled with CFSE, and stimulated with anti-CD3/CD28 beads for 4 d. Proliferation of CD4+ T cells was analyzed by quantifying the dilution of CFSE signal measured by flow cytometry. (B) CD8+CD25+ T cells induced by suboptimal stimulation with SEC1 for 6 d were purified and cocultured with CFSE-labeled CD4+CD25− T cells at various ratios for 4 d in the absence or presence of anti-CD3/CD28 beads. (C) CD8+CD25+ T cells induced by optimal stimulation with SEC1 for 4 d were purified and cocultured with CFSE-labeled CD4+CD25− T cells for 4 d in the absence or presence of anti-CD3/CD28 beads. (D) Percentage (mean ± SEM) of nonproliferating CD4+ T cells combined from nine independent experiments (three donors). Different letters indicate significant differences in the mean percentage between treatments, as determined by ANOVA, followed by the Tukey HSD test (p < 0.001). To investigate whether the suppressive activity of CD8+CD25+ T cells induced by suboptimal stimulation with SEC1 is mediated by cell–cell contact or soluble factors, we conducted autologous MLR using mitomycin C–treated CD8+CD25+ T cells to prevent de novo T cell activation or in a Transwell to prevent direct cell–cell contact but allow the migration of soluble factors (for soluble factor–dependent suppression). Mitomycin C–treated CD8+CD25+ T cells completely inhibited the proliferation of naive CD4+CD25− T cells in response to anti-CD3/CD28 beads (Fig. 4). In contrast, CD8+CD25+ T cells in a Transwell partially inhibited the proliferation of naive CD4+CD25− T cells in response to anti-CD3/CD28 beads (Fig. 4). These results suggest that the suppressive activity by CD8+CD25+ T cells induced by suboptimal stimulation with SEC1 is mediated predominantly by cell–cell contact but also involves soluble factors. Suppression by CD8+CD25+ T cells induced by suboptimal stimulation with SEC1 is mediated in a cell–cell contact-dependent manner to a larger extent than in a soluble factor–dependent manner. CFSE-labeled naive CD4+ T cells were cocultured with an equal number of CD8+CD25+ T cells induced by suboptimal stimulation with SEC1 and fixed with mitomycin C for a contact-dependent suppression assay or with CD8+CD25+ T cells in the top chamber of a Transwell for a soluble factor–dependent suppression assay. Cells were stimulated with anti-CD3/CD28 beads, and proliferation of CD4+ T cells was analyzed by flow cytometry. (A) A single representative result for CFSE dilution. (B) Percentage (mean ± SEM) of nonproliferating CD4+ T cells combined from nine independent experiments (three donors). Different letters indicate significant differences in the mean percentage between treatments, as determined by ANOVA, followed by the Tukey HSD test (p < 0.001). To characterize the phenotype of CD8+CD25+ T cells induced by suboptimal stimulation with SEC1 for 6 d, cellular markers related to Tregs were evaluated using flow cytometry. Before stimulation, naive CD8+ T cells did not express classical Treg markers, such as CD25, CTLA-4, GITR, OX-40, TNFR2, and CD45RO (Supplemental Fig. 2A). After suboptimal stimulation, CD8+CD25+ cells highly expressed CD25, CD28, HLA-DR, CTLA-4, TNFR2, and CD45RO, but the expression of CD127, GITR, and OX40 was decreased or was slightly increased (Supplemental Fig. 2A). Further analysis of the phenotype of CD8+CD25+FOXP3+ T cells was performed by gating on CD8+CD25+ T cells. CD8+CD25+FOXP3+ T cells highly expressed CD28, CD45RO, CTLA-4, HLA-DR, and TNFR2, and <20% of CD8+CD25+FOXP3+ T cells expressed CD127, GITR, and OX40 (Fig. 5A, Supplemental Fig. 2B). It is noteworthy that CTLA-4 was detected by intracellular staining and not by surface staining. CD8+CD25+ T cells induced by optimal stimulation with SEC1 showed similar phenotypes, with the exception of higher expression of GITR and OX40, compared with suboptimal stimulation (Supplemental Fig. 3). Expression of cell surface markers and cytokines related to Tregs by CD8+CD25+ T cells induced by suboptimal stimulation with SEC1. Human PBMCs depleted of CD25+ T cells were stimulated with a suboptimal concentration of SEC1 (1 ng/ml) for 6 d. Expression of surface markers and cytokines related to Tregs was measured by flow cytometry and a Luminex ELISA kit. (A) Percentage (mean ± SEM) of CD8+CD25+FOXP3+ T cells expressing surface markers related to Tregs combined from nine independent experiments (three donors). Expression of CTLA-4 was measured by intracellular staining. (B) Percentage (mean ± SEM) of CD8+CD25+ T cells expressing cytokines related to Tregs measured by intracellular staining and flow cytometry. Data are combined from nine independent experiments (three donors). (C) During suboptimal stimulation with SEC1, the culture supernatant was collected every 2 d and analyzed using a Milliplex Luminex cytokine analysis kit. Data shown are combined results from six independent experiments (two donors). To determine the functional characteristics of CD8+CD25+ T cells induced by suboptimal stimulation with SEC1, expression of cytokines related to regulatory functions, such as IL-2, IL-10, TGF-β, and IFN-γ, were analyzed using flow cytometry and a Milliplex Luminex cytokine analysis kit. Before stimulation, minimal expression of IL-2, IL-10, TGF-β, and IFN-γ in CD8+ T cells was detected (Fig. 5B, Supplemental Fig. 4). Upon suboptimal stimulation, IL-2 gradually increased and peaked at day 4 and then gradually decreased at day 6. Expression of IL-10, TGF-β, and IFN-γ gradually increased by day 6 and was sustained. Notably, a decrease in IL-2 expression at 6 d (Fig. 5B, Supplemental Fig. 4) was concurrent with an increase in FOXP3 expression (Fig. 2), which is a known transcriptional repressor of the IL-2 promoter. Similar patterns of cytokine secretion in the culture media were observed using a Milliplex Luminex cytokine analysis kit (Fig. 5C). Taken together, CD8+CD25+FOXP3+ T cells induced by suboptimal stimulation with SEC1 were CD28+, CTLA4+, TNFR2+, CD45RO+, HLA-DR+, and they secreted IL-10, TGF-β, and IFN-γ. Previous studies demonstrated that immunosuppression by CD4+ and CD8+ Tregs is mediated by CTLA-4, IL-10, TGF-β, and IFN-γ via membrane-bound receptors or direct interaction with APCs and CD4+ T cells (15, 23, 24, 30, 31). Because expression of these molecules was highly increased in CD8+CD25+ T cells induced by suboptimal stimulation with SEC1, we sought to determine their role in immunosuppression using neutralizing mAbs. Blockade of CTLA-4, IL-10, TGF-β, and IFN-γ using mAb failed to inhibit the suppressive activity of CD8+CD25+ T cells induced by suboptimal stimulation with SEC1 (Fig. 6). Various combinations of mAb against these proteins and cytokines also did not affect the suppressive activity (data not shown). Suppression by CD8+CD25+ T cells induced by suboptimal stimulation with SEC1 was not dependent on TGF-β, IL-10, IFN-γ, CTLA-4, cAMP, or COX. 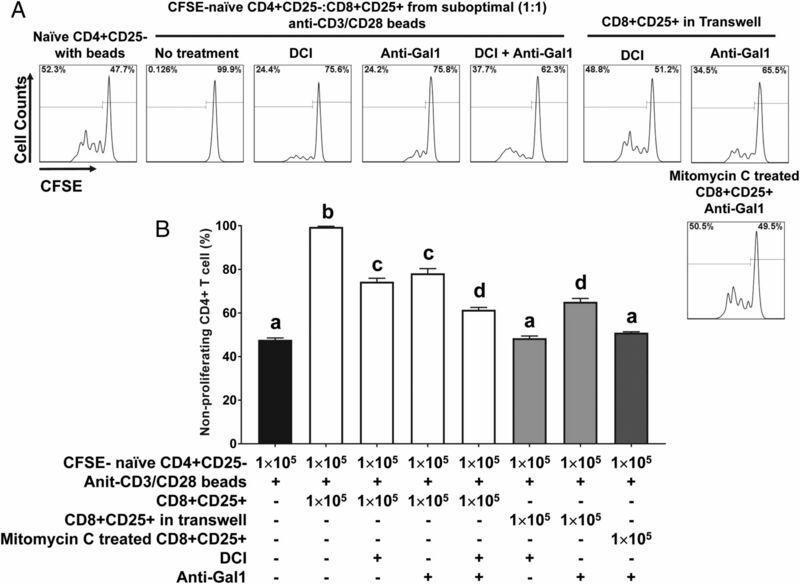 CFSE-labeled naive CD4+CD25− T cells (1 × 105) were cocultured with an equal number of CD8+CD25+ T cells induced by suboptimal stimulation with SEC1 in the presence of anti-CD3/CD28 beads and mAb (10 μg/ml) neutralizing CTLA-4, TGF-β, IL-10, IFN-γ, indomethacin (25 μM, COX inhibitor), or ZM241385 (10 μM, adenosine 2A antagonist) for 4 d. Proliferation of CD4+ T cells was analyzed by flow cytometry. Data shown are a single representative CFSE dilution line graph from nine independent experiments (three donors). Adenosine released by Tregs triggers accumulation of intracellular cAMP, which induces the transcriptional factor inducible cAMP early repressor, resulting in suppression of T cells (32). Blockade of adenosine receptor 2A by the small molecule inhibitor ZM241385 (33), with an increasing dose up to 10 μM, did not affect the suppressive activity of CD8+CD25+ T cells induced by suboptimal stimulation (data with 10 μM are shown in Fig. 6). A previous study showed that CD4+CD25+ Tregs express cyclooxygenase-2 and produce PGE2, which suppress T cell immune responses by eliciting cAMP-mediated immune suppression (34). However, inhibition of COX by indomethacin, with an increasing dose up to 25 μM, also did not affect the suppressive activity of CD8+CD25+ T cells (data with 25 μM are shown in Fig. 6). In an effort to elucidate phenotypic and functional markers of CD8+ Tregs, we performed transcriptomic and proteomic analyses and found that galectin-1 and granzyme A and B were consistently upregulated in CD8+CD25+ T cells induced by suboptimal stimulation with SEC1. To confirm the transcriptomic and proteomic analysis results, we measured the expression of galectin-1 and granzymes in CD8+CD25+ T cells using flow cytometry. Under optimal and suboptimal stimulation conditions, galectin-1 was predominantly detected by intracellular staining and not by surface staining (Fig. 7). Similarly, granzyme A and B were highly expressed intracellularly in CD8+CD25+ T cells (Fig. 7). Finally, blockade of galectin-1 with an anti–Gal-1 mAb or blockade of granzymes with a serine protease inhibitor (DCI) partially attenuated the suppressive activity of CD8+CD25+ T cells induced by suboptimal stimulation, restoring ∼50% of proliferation compared with the naive CD4+ T cell control (Fig. 8). Combined treatment with DCI and anti–Gal-1 restored ∼75% of native T cell proliferation (Fig. 8). Furthermore, addition of anti–Gal-1 mAb to autologous MLR using mitomycin C–treated CD8+CD25+ T cells fully inhibited suppressive activity. In contrast, addition of anti–Gal-1 mAb to autologous MLR in Transwells did not inhibit the suppressive activity. These results strongly suggest that galectin-1 is largely responsible for the contact-dependent suppression by CD8+CD25+ T cells induced by suboptimal stimulation with SEC1. Granzymes are well-known soluble factors that are produced by cytotoxic CD8+ T cells, and they induce apoptosis in target cells (35). Addition of DCI, a serine protease inhibitor, to the autologous MLR in Transwells fully inhibited the suppressive activity of CD8+ Tregs. These results suggest that granzymes are responsible for the soluble factor–dependent suppression by CD8+CD25+ T cells induced by suboptimal stimulation with SEC1. Expression of galectin-1 and granzymes by CD8+CD25+ T cells induced by optimal and suboptimal stimulation with SEC1. (A) PBMC/CD25− T cells were stimulated with an optimal (1 μg/ml) and suboptimal (1 ng/ml) concentration of SEC1 for 4 and 6 d, respectively. 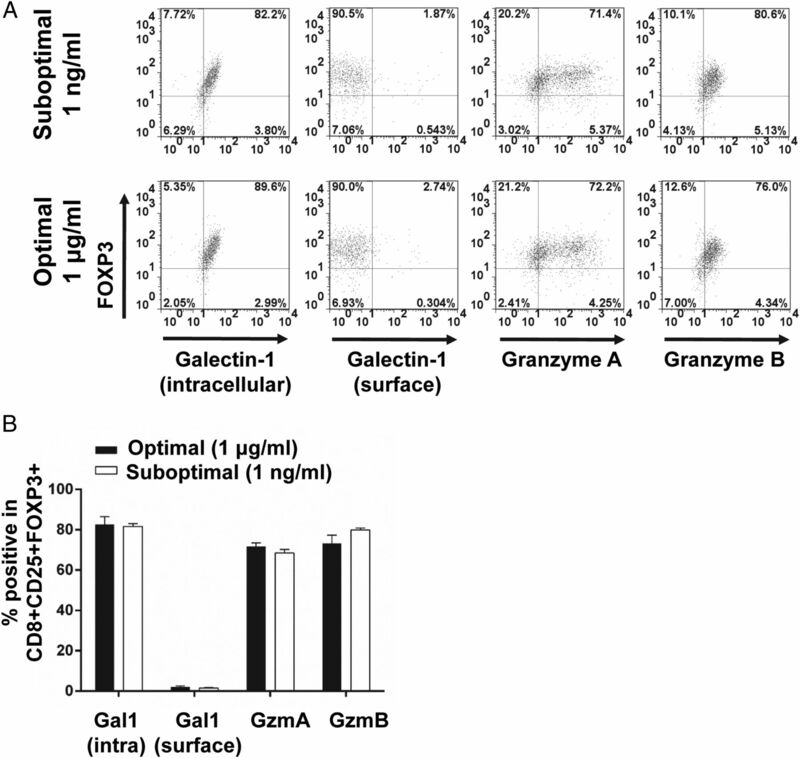 Intracellular and surface expression of galectin-1 and intracellular expression of granzyme A and B were analyzed by flow cytometry. Data shown are representative dot plots gated on CD8+CD25+ T cells. (B) Percentage (mean ± SEM) of CD8+CD25+FOXP3+ T cells expressing galectin-1, granzyme A, or granzyme B combined from nine independent experiments (three donors). The suppressive activity of CD8+CD25+ T cells induced by suboptimal stimulation with SEC1 is mediated by galectin-1 and granzymes. 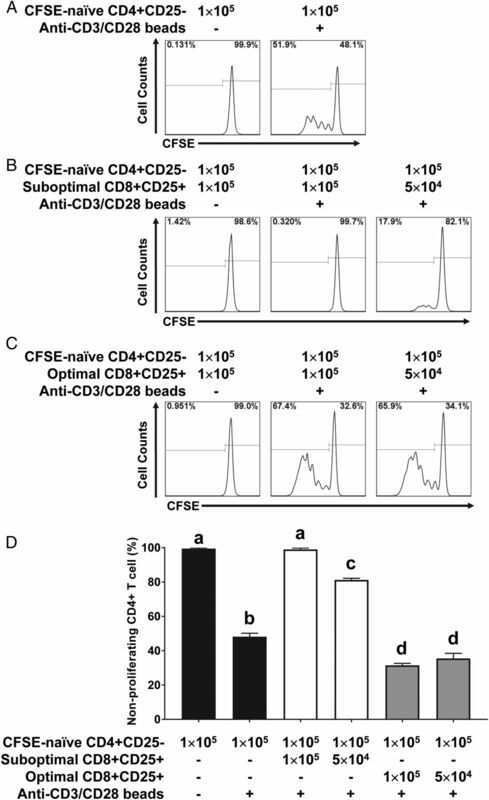 CFSE-labeled naive CD4+CD25− T cells (1 × 105) were cocultured with an equal number of CD8+CD25+ T cells induced by suboptimal stimulation with SEC1 in the presence of anti-CD3/CD28 beads and a mAb (10 μg/ml) neutralizing galectin-1 and/or DCI (50 μM, serine protease inhibitor) for 4 d. In some experiments, CD8+CD25+ T cells induced by suboptimal stimulation with SEC1 were added to the top chamber of the Transwell or were fixed with mitomycin C and added to the coculture, as described in Fig. 4. Proliferation of CD4+ T cells was analyzed by flow cytometry. (A) Representative CFSE dilution line graphs. (B) Percentage (mean ± SEM) of nonproliferating CD4+ T cells combined from nine independent experiments (three different donors). Different letters indicate significant differences in the mean percentage between treatments, as determined by ANOVA, followed by the Tukey HSD test (p < 0.001). Although it is well documented that CD4+ T cells are activated by SAgs that directly bind to specific Vβ segments of TCR on CD4+ T cells and MHCII on APCs (36), the exact mechanism by which CD8+ T cells are activated by SAgs is not clearly understood. For instance, it is possible that induction of CD8+CD25+FOXP3+ T cells by SEC1 might be due to a direct activation of CD8+ T cells by SEC1 or by an indirect effect following activation of CD4+ T cells by SEC1. To address these questions, naive CD8+CD25− T cells were purified from human PBMCs and stimulated with SEC1 under suboptimal conditions in the presence or absence of APCs (CD14+ cells). In the presence of APCs, SEC1 induced CD25 and FOXP3 expression in CD8+ T cells (Fig. 9A). In contrast, in the absence of APCs, SEC1 was unable to induce CD25 and FOXP3 expression in CD8+ T cells (Fig. 9A). These results indicated that activation of CD8+ T cells by SEC1 requires the presence of APCs. To determine whether activation of CD8+ T cells by SEC1 is initiated through the TCR signaling pathway, CD8+ T cells were incubated with SEC1 for 10 min, and phosphorylation of ITAMs in the CD3ζ chain, the initial event in the TCR signaling cascade, was measured by Western blot. Phosphorylation of the CD3ζ chain was detected in CD8+ T cells activated with SEC1 in the presence of APCs but not in the absence of APCs (Fig. 9B). To determine whether activation of CD8+ T cells by SEC1 is also dependent on TCR Vβ, distribution of the TCR Vβ repertoire in CD8+ T cells before and after stimulation with SEC1 was measured using quantitative real-time PCR. Results showed that selective expansion of CD8+ T cells bearing TCR Vβ 3, 12, 13.2, 14, 15, 17, and 20 occurred (Fig. 9C). These results were identical to those previously observed with CD4+ T cells (29). Flow cytometry results further confirmed the quantitative real-time PCR results showing an increase in Vβ 14 after stimulation with SEC1 (Fig. 9D). Finally, CD8+CD25+ T cells induced by suboptimal stimulation with SEC1 in the absence of CD4+ T cells were able to suppress the proliferation of responder cells (Fig. 9E), indicating that induction of CD8+ Tregs by suboptimal stimulation with SEC1 is independent from CD4+ T cells. Together, these results suggest that SEC1 directly activates CD8+ T cells via the TCR signaling pathway in an APC-restricted and TCR Vβ–dependent manner, similar to the mechanism documented in CD4+ T cells. The results also demonstrate that suboptimal stimulation induces expansion of immunosuppressive CD8+CD25+FOXP3+ T cells. Induction of CD8+CD25+FOXP3+ T cells by SEC1 is APC restricted and TCR Vβ dependent. CD8+CD25− T cells were purified from human PBMCs and stimulated with SEC1 (1 ng/ml) in the presence or absence of CD14+ cells. (A) After 6 d of stimulation, expression of CD25 and FOXP3 was measured using flow cytometry. Data shown are representative results from nine independent experiments (three donors). (B) After stimulation with SEC1 (1 ng/ml) for 10 min, cells were lysed, and cell lysates were analyzed by immunoblotting using mAb specific to phosphorylated CD3ζ as an indication of T cell activation via TCR. The level of β-actin was used as a loading control. (C) After 4 d stimulation with SEC1 (1 ng/ml), the selective expansion of TCR Vβ was measured by quantitative real-time PCR. Data are mean ± SEM of six independent experiments (two donors). (D) Expression of TCR Vβ14 in CD8+CD25+FOXP3+ T cells was measured by flow cytometry. Data shown are the mean percentage of CD8+CD25+Vβ14+ T cells combined from six independent experiments (two donors). (E) CD8+CD25+ T cells were induced by stimulation of purified CD8+CD25− T cells with SEC (1 ng/ml) in the presence of CD14+ cells. Purified CD8+CD25+ T cells were cocultured as described in Fig. 3. Data shown are a single representative CFSE dilution line graphs from nine independent experiments (three donors). It has long been postulated that staphylococcal SAgs contribute to the pathogenesis of S. aureus because they are potent immune modulators. However, although TSS caused by exposure to high concentrations of SAgs (1–100 μg) is well documented, relatively little is known about the effect of low concentrations of SAgs (1–10 ng) that are associated with more frequent types of asymptomatic mucosal colonization or chronic infections by S. aureus. A recent study demonstrated that stimulation of human PBMCs with SAgs at a concentration of 1 ng/ml induced immunosuppressive CD8+CD25+FOXP3+ T cells (25). However, the mechanism of suppression still remains elusive, and the functional characteristics of CD8+CD25+FOXP3+ induced by stimulation with a higher concentration of SAgs have not been tested. In this study, we demonstrated, for the first time to our knowledge, that the concentration of SAgs markedly influences the functional characteristics of CD8+ T cells. Specifically, suboptimal stimulation by SAg induces functionally immunosuppressive CD8+ Tregs, whereas optimal stimulation by SAg induces expression of phenotypic markers of CD8+ Tregs, but these cells are not functionally immunosuppressive. We further determined that immunosuppression by CD8+CD25+ T cells induced by suboptimal stimulation with SEC1 was mediated primarily by galectin-1 and granzymes in a contact-dependent and soluble factor–dependent manner, respectively. Our results suggest that exposure to a higher concentration of SAg induces T cell activation, without the development of Tregs leading to uncontrolled inflammation, likely contributing to conditions, such as TSS. Our results further suggest that exposure to lower concentrations of SAg induces T cell activation that leads to the development of Tregs, resulting in immune suppression. Together, these results demonstrate that SAgs can induce completely opposite immune responses (i.e., TSS versus immune suppression), depending on the concentration of SAg presented to the host immune system. A limitation in investigating Tregs in humans is the continued identification of, and debate about, specific markers. Although FOXP3 has an essential role in the development of Tregs, as demonstrated in this study and others, it may not be a reliable marker for Tregs, especially in humans, because T cell activation via TCR transiently induces expression of FOXP3 in CD4+ and CD8+ T cells (37, 38). In line with other investigators’ findings, our results showed that CD8+CD25+ T cells induced by optimal stimulation with SEC1 also highly expressed FOXP3 but were not immunosuppressive. Thus, expression of FOXP3 is necessary for the development of Tregs but is not sufficient to define Tregs. Induction and development of FOXP3+ Tregs require synergistic interaction of cellular signaling pathways. They include suboptimal stimulation through TCR/MHCII, without CD28/CD86 costimulatory signals or with inhibitory signals by CTLA-4. These signaling cascades lead to inactivation of PI3K–AKT–mTOR pathways and activation of inhibitory cytokine pathways, such as TGF-β/TGF-βR and TNF-α/TNFR superfamily (39–41). In this study, the phenotypes and cytokines produced by CD8+CD25+FOXP3+ T cells induced by suboptimal stimulation with SEC1 were CD28+, CTLA4+, TNFR2+, CD45RO+, HLA-DR+, IL-2+, IL-10+, IFN-γ+, and TGF-β+, which satisfied several conditions to induce FOXP3+ Tregs: suboptimal stimulation through TCR/MHCII, induction of CTLA-4 expression, and induction of TGF-β and IL-10 expression. However, it is noteworthy that the nonimmunosuppressive CD8+CD25+FOXP3+ T cells induced by optimal stimulation with SEC1 also showed similar phenotypes and cytokines to those observed with the immunosuppressive CD8+CD25+ T cells induced by suboptimal stimulation. A recent study demonstrated that stimulation of T cells in the presence of IL-2 and TNFR superfamily ligands (GITR-L, OX40-L, 4-1BB-L, and TNF) induced higher expression of FOXP3 than stimulation without those ligands. This would explain the higher expression of FOXP3 in CD8+CD25+ T cells induced by optimal stimulation, in which GITR, OX40, and TNFR2 were more highly expressed than with suboptimal stimulation. However, functional maturation of Tregs may require additional signals. The CD28 molecule, which is highly expressed in CD8+CD25+ T cells induced by suboptimal and optimal stimulation conditions, may contribute to the functional maturation of FOXP3+ T cells differently. Previous studies demonstrated that a costimulation signal through CD28 is required for thymus-derived CD4+CD25+FOXP3+ T cell development by inducing expression of TNFR superfamily members; however, strong costimulation through CD28 suppressed the differentiation of CD4+CD25+FOXP3+ T cells or induced CD4+CD25+FOXP3+ T cells. Importantly, a recent study demonstrated that SAgs can directly interact with CD28, which is essential to elicit an inflammatory cytokine storm in TSS (42). It is possible that the excessive amount of SAgs in optimal stimulation conditions may directly interact with CD28 and induce strong costimulatory signals that differentially activate TNFR superfamily signaling pathways leading to CD8+CD25+FOXP3+ T cells that lack suppressive activity. Further research is necessary to determine the role of SAg interaction with CD28 in the functional maturation of CD8+ Tregs. A number of studies have reported diverse mechanisms of immunosuppression by CD8+ Tregs. The CD8+ Tregs originally reported in the murine model interacted with activated CD4+ T cells expressing the MHC class 1b molecule, Qa-1, via TCR and suppressed self-reactive autologous CD4+ T cells (43). Clinical studies in humans revealed that human CD8+ Tregs interacted with HLA-E, equivalent to murine Qa-1, expressed on self-reactive CD4+ T cells and suppressed self-reactive CD4+ T cells by killing Ag-activated autologous CD4+ T cells in autoimmune type 1 diabetes and multiple sclerosis (44). Other types of CD8+ Tregs suppressed immune responses by mediating negative signals to APCs via cell–cell interaction (e.g., CTLA-4 and CD80/86) and ILT-1 and ILT-4 on APCs (22), inducing immunomodulatory cytokines (e.g., TGF-β and/or IL-10) and altering metabolic activities, such as inducing cytotoxic tryptophan catabolism through induction of IDO (45). We determined the roles of CTLA-4, IFN-γ, IL-10, TGF-β, cAMP, and COX that were previously described to mediate immunosuppression by Tregs. However, these molecules were not responsible for immunosuppression by CD8+CD25+ T cells induced by suboptimal stimulation with SEC1. In a search for unique phenotypic and functional markers of CD8+ Tregs, we found that galectin-1 and granzyme A and B were consistently upregulated in CD8+CD25+ T cells from our RNA sequencing and proteomics analyses. Galectin-1, a member of the β-galactoside–binding proteins, is expressed by thymic epithelial cells, activated CD8+ T cells, and macrophages and is secreted by a noncanonical mechanism that bypasses the endoplasmic reticulum and the Golgi apparatus (46). Galectin-1 interacts with CD4, CD7, CD43, CD45, and CD69 and extracellular matrix glycoproteins, such as laminin, fibronectin, and vitronectin, and it regulates cell homeostasis and inflammation (47). Previous studies demonstrated that addition of galectin-1 to activated human T cells and leukemic cell lines triggers the clustering and polarization of CD7, CD43, and CD45, followed by signaling events leading to apoptosis (46). A recent study demonstrated that galectin-1 is highly expressed and secreted in activated CD4+CD25+ Tregs, and blockade of galectin-1 by anti–Gal-1 mAb significantly reduced the suppressive activity of CD4+CD25+ Tregs, suggesting that galectin-1 is a key effector molecule for immune regulation (48). Granzymes are serine proteases that induce apoptosis of target cells by activating a caspase cascade. Several studies have demonstrated that CD4+CD25+ Tregs also express granzyme A and/or B and induce apoptosis in various autologous immune cells in a perforin-dependent, but FasL-independent, manner (49). In our study, the blockade of galectin-1 and granzymes using an anti–Gal-1 mAb and DCI significantly, but not completely, inhibited the suppressive activity of CD8+CD25+ T cells induced by suboptimal stimulation with SEC1. These results indicate that, although galectin-1 and granzymes are primarily responsible for the suppression, there are additional mechanism of suppression. Combined results from autologous MLR using mitomycin C–treated CD8+CD25+ T cells and Transwells with anti–Gal-1 mAb strongly suggest that contact-dependent suppression is mediated by galectin-1. However, it is noteworthy that expression of galectin-1 was only detected intracellularly and that it was also highly expressed in CD8+CD25+ T cells induced by optimal stimulation with SEC1. These results raise questions regarding the role of galectin-1 in immune suppression by CD8+CD25+ T cells induced by optimal stimulation with SEC1. It is possible that the anti–Gal-1 mAb recognizes an epitope involved in binding to its receptor so that anti–Gal-1 mAb is able to neutralize the binding of galectin-1 to receptors but is unable to detect galectin-1 bound to the receptors on the surface of CD8+CD25+ T cells induced by suboptimal and optimal stimulation with SEC1, because the epitope for anti–Gal-1 mAb is occupied with its receptors. It is also possible that CD8+CD25+ T cells induced by suboptimal stimulation with SEC1 express a unique surface protein that interacts, either directly or indirectly, with galectin-1 to mediate the contact-dependent suppression. These possibilities are currently under investigation. Elucidating the galectin-1 receptor and its ligand on the target cells would be critical to identify specific surface markers of Tregs and understand their suppression mechanism. In conclusion, our results clearly demonstrate the contribution of SAgs expressed at low concentrations in the pathogenesis of S. aureus by inducing immunosuppressive CD8+ Tregs that can deteriorate host cellular immunity, leading to bacterial colonization and spreading and eventually to highly lethal invasive infections. Several population genomics studies revealed that commensal and clinical S. aureus strains more frequently harbor five or six SAg genes (seg, sei, sem, sen, seo, and/or seu) clustered in the enterotoxin gene cluster (egc) (11, 50–53). These SAgs are intrinsically regulated to be expressed at low concentrations that have a potential to induce Tregs. These results further support the biological fitness of S. aureus strains expressing SAgs at low concentrations in the pathogenic evolution of S. aureus. Further studies investigating the alteration of cellular signaling pathways in a SAg concentration–dependent manner and molecular mechanisms of immunosuppression by CD8+ Tregs will contribute to the design of novel therapeutic strategies against S. aureus infection. This work was supported by the Center for Biomedical Research Excellence in Pathogen–Host Interactions, National Institute of General Medical Sciences, National Institutes of Health (Grant 1P20GM103646-01A1 to K.S.S., B.L.F.K., and S.B.P. ), the Animal and Plant Quarantine Agency, South Korea (Grant I-1543081-2015-17-01 to K.S.S. ), and the National Institutes of Health (Grant P20GM103436 to J.W.P.).
. 2007. Hospitalizations and deaths caused by methicillin-resistant Staphylococcus aureus, United States, 1999-2005. Emerg. Infect. Dis. 13: 1840–1846.
. 2012. Contribution of selected gene mutations to resistance in clinical isolates of vancomycin-intermediate Staphylococcus aureus. Antimicrob. Agents Chemother. 56: 5845–5851.
. 2007. Factors predicting mortality in necrotizing community-acquired pneumonia caused by Staphylococcus aureus containing panton-valentine leukocidin. Clin. Infect. Dis. 45: 315–321.
. 2013. Staphylococcal and streptococcal superantigen exotoxins. Clin. Microbiol. Rev. 26: 422–447.
. 1999. Understanding the mechanism of action of bacterial superantigens from a decade of research. Immunol. Rev. 168: 257–269.
. 1989. V beta-specific stimulation of human T cells by staphylococcal toxins. Science 244: 811–813.
. 2001. Toxic shock syndrome and bacterial superantigens: an update. Annu. Rev. Microbiol. 55: 77–104.
. 1989. The V beta-specific superantigen staphylococcal enterotoxin B: stimulation of mature T cells and clonal deletion in neonatal mice. Cell 56: 27–35.
. 1993. The fate of anergic T cells in vivo. J. Immunol. 150: 763–770.
. 2011. A novel core genome-encoded superantigen contributes to lethality of community-associated MRSA necrotizing pneumonia. PLoS Pathog. 7: e1002271.
. 2016. Novel tissue level effects of the Staphylococcus aureus enterotoxin gene cluster are essential for infective endocarditis. PLoS One 11: e0154762.
. 2003. Inflammatory responses of bovine polymorphonuclear neutrophils induced by staphylococcal enterotoxin C via stimulation of mononuclear cells. Clin. Diagn. Lab. Immunol. 10: 1011–1018.
. 2007. Long-term staphylococcal enterotoxin C1 exposure induces soluble factor-mediated immunosuppression by bovine CD4+ and CD8+ T cells. Infect. Immun. 75: 260–269.
. 2006. Staphylococcus aureus enterotoxin D is secreted in milk and stimulates specific antibody responses in cows in the course of experimental intramammary infection. Infect. Immun. 74: 3507–3512.
. 2012. Regulatory T cells: mechanisms of differentiation and function. Annu. Rev. Immunol. 30: 531–564. 2007. Regulatory T cells and infection: a dangerous necessity. Nat. Rev. Immunol. 7: 875–888.
. 2011. Regulatory T cells in infection. Adv. Immunol. 112: 73–136.
. 2004. In vivo instruction of suppressor commitment in naive T cells. J. Exp. Med. 199: 1401–1408. 2000. Regulatory T cells: key controllers of immunologic self-tolerance. Cell 101: 455–458.
. 1970. Cell interactions in the induction of tolerance: the role of thymic lymphocytes. Immunology 18: 723–737.
. 1998. Specific suppression of human CD4+ Th cell responses to pig MHC antigens by CD8+CD28- regulatory T cells. J. Immunol. 161: 5193–5202.
. 2008. Acquisition of suppressive function by activated human CD4+ CD25− T cells is associated with the expression of CTLA-4 not FoxP3. J. Immunol. 181: 1683–1691.
. 2012. Induction of contact-dependent CD8(+) regulatory T cells through stimulation with staphylococcal and streptococcal superantigens. Immunology 135: 158–167.
. 1988. Preparation of toxic shock syndrome toxin-1. Methods Enzymol. 165: 37–43.
. 2004. 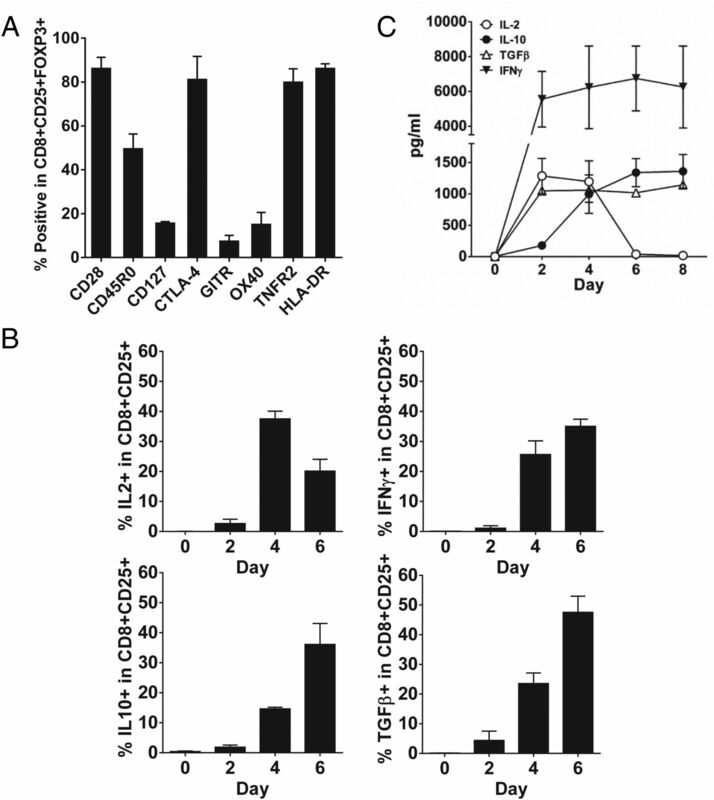 Control of Foxp3+ CD25+CD4+ regulatory cell activation and function by dendritic cells. Int. Immunol. 16: 1769–1780.
. 2010. Mitomycin C inhibits ribosomal RNA: a novel cytotoxic mechanism for bioreductive drugs. J. Biol. Chem. 285: 19068–19075.
. 2010. A quantitative real time PCR method to analyze T cell receptor Vbeta subgroup expansion by staphylococcal superantigens. J. Transl. Med. 8: 2.
. 2010. Much ado about adenosine: adenosine synthesis and function in regulatory T cell biology. J. Immunol. 185: 1993–1998.
. 2012. CD8+CD45RA+CCR7+FOXP3+ T cells with immunosuppressive properties: a novel subset of inducible human regulatory T cells. J. Immunol. 189: 2118–2130.
. 2006. FOXP3+CD4+CD25+ adaptive regulatory T cells express cyclooxygenase-2 and suppress effector T cells by a prostaglandin E2-dependent mechanism. J. Immunol. 177: 246–254. 2001. Granzymes: a family of lymphocyte granule serine proteases. Genome Biol. 2: REVIEWS3014.
. 1987. A T cell receptor V beta segment that imparts reactivity to a class II major histocompatibility complex product. Cell 49: 263–271.
. 2007. Induction of FOXP3 expression in naive human CD4+FOXP3− T cells by T-cell receptor stimulation is transforming growth factor-beta dependent but does not confer a regulatory phenotype. Blood 110: 2983–2990.
. 2007. Selective survival of naturally occurring human CD4+CD25+Foxp3+ regulatory T cells cultured with rapamycin. J. Immunol. 178: 320–329.
. 2008. Cutting edge: Foxp3-mediated induction of pim 2 allows human T regulatory cells to preferentially expand in rapamycin. J. Immunol. 180: 5794–5798.
. 2012. Regulatory T cells exhibit decreased proliferation but enhanced suppression after pulsing with sirolimus. Am. J. Transplant. 12: 1441–1457.
. 2013. CD28: direct and critical receptor for superantigen toxins. Toxins 5: 1531–1542.
. 2006. Therapeutic induction of regulatory, cytotoxic CD8+ T cells in multiple sclerosis. J. Immunol. 176: 7119–7129.
. 2004. 4-1BB-mediated immunotherapy of rheumatoid arthritis. Nat. Med. 10: 1088–1094.
. 1995. Apoptosis of T cells mediated by galectin-1. Nature 378: 736–739.
. 2012. Galectin-1 research in T cell immunity: past, present and future. Clin. Immunol. 142: 107–116.
. 2007. Galectin-1: a key effector of regulation mediated by CD4+CD25+ T cells. Blood 109: 2058–2065.
. 2005. Cutting edge: contact-mediated suppression by CD4+CD25+ regulatory cells involves a granzyme B-dependent, perforin-independent mechanism. J. Immunol. 174: 1783–1786.
. 2004. Systematic survey on the prevalence of genes coding for staphylococcal enterotoxins SElM, SElO, and SElN. Mol. Nutr. Food Res. 48: 488–495.
. 2005. Relationships between toxin gene content and genetic background in nasal carried isolates of Staphylococcus aureus from Asturias, Spain. FEMS Microbiol. Lett. 243: 447–454.
. 2015. Phage-mediated horizontal transfer of a Staphylococcus aureus virulence-associated genomic island. Sci. Rep. 5: 9784.
. 2016. Mobilization of genomic Islands of Staphylococcus aureus by temperate bacteriophage. PLoS One 11: e0151409.